A great app that you can find on some of the Apple iOS units is the Photos application. There are vast number of applications available and of course you can go and get them at the Apple App Store. It easily has a lot of functionality and is integrated into the operating system which is enough to make one really like this app. In spite of these features, there are some things about this app that make it really frustrating to continue having a great love affair with the app. If you are a person that loves to take pictures and then loves to send them to friends and family, you may find that you may reach a high level of frustration when you try to send them in your email and can only send five at a time. Now this may not be a limitation that you are aware of. 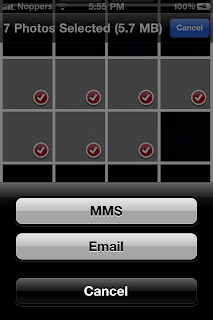 Yes, there is a limit to the number of images that you can send to the email application from inside the photos app. The Photos app has seen some great improvements with the version 4 and version 5 of the iOS. Some of these improvements included the ability to create individual user albums from the camera roll. Another feature that this app has is the ability to see a world map. This world map shows where the images were actually taken due to a geotag that was embedded in the image when it was taken. In spite of these wonderful features, if you have a lot of images that you would like to share with your friends and family, then it can be quite frustrating if you can only send 5 at a time. Well, thanks to a developer known as “noppers”, there is a new app that is available that is known as the 'Mail More Photos' tweak. It is available in the Cydia store in the ModMyi repository. The Mail More Photos app connects to the Photos App and allows the user to select as many photographs as they want and then share them with their family and friends through their email. What is really nice is that the navigation bar of the is updated to show how many images are selected and the size is displayed in megabytes. This is really nice for the user if you are sending images to someone and their email has an inbox receiving limit. You will need to make sure that you are using a device that is jailbroken and the device must also run the an iOS that is 4 or higher. It is not expensive to try as the tweak is only .99. If you are ready to email as many photos as you want go ahead and pick up the MailMore photos. 0 Respones to "The MailMore Tweak"